That was another awesome trip and the farthest I’ve been for long driving! 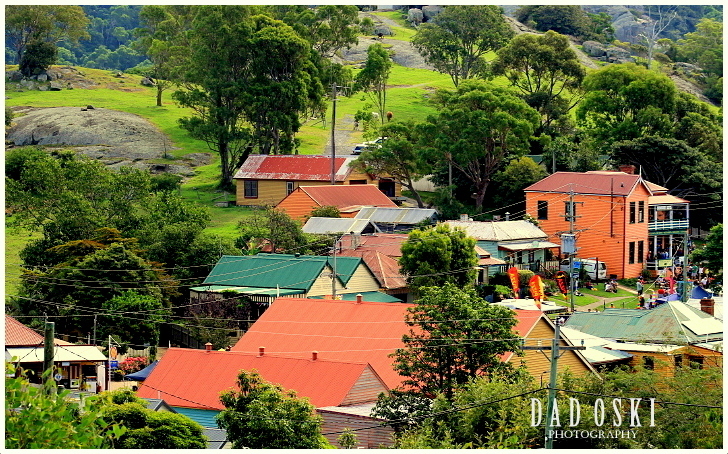 From this trip I’ve learned and came to know heaps of spectacular places far down south of New South Wales. 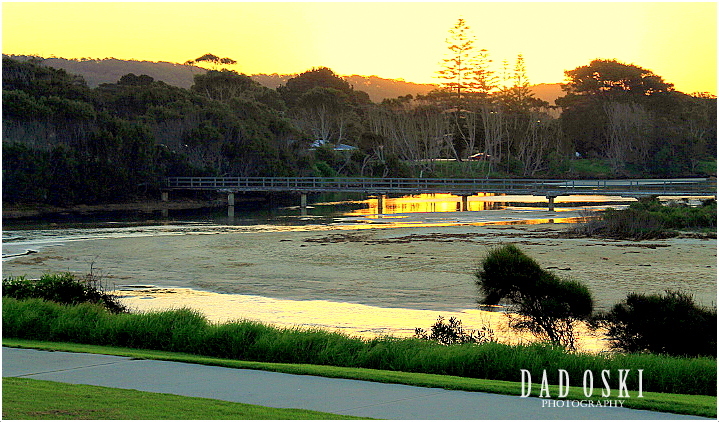 They define the Far South Coast as the three local government areas of Shoalhaven, Eurobodalla and Bega Valley. 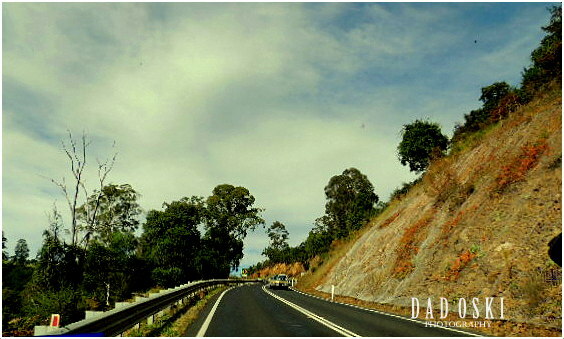 It incorporates the major towns of Nowra, Milton/Ulladulla, Batemans Bay, Moruya, Narooma, Bega, Merimbula, Pambula and Eden and runs from south of Wollongong to the Victorian border. The plan was to have our sleep over at Dalmeny for three days while we explore the neighbouring towns. But it was more than that when we were there. As we travelled down the region, the plan changed. For the three day duration, we had visited Ulladulla, Milton, Bodalla, Batemans Bay, Dalmeny, Naroma, Bega, Merimbula, Tilba Tilba, and Bermagui. We haven’t reach Eden for we didn’t have enough time. The trip begun early part of 2013, and we had our breakfast at Appin Park ner Appin Township, shops were not opened yet, while the sun started to rise up by then. Not long enough we continued our trip and we passed by the township of Milton. Some old buildings still exists here and they’re still looking good. I took some remembrance photos here too. 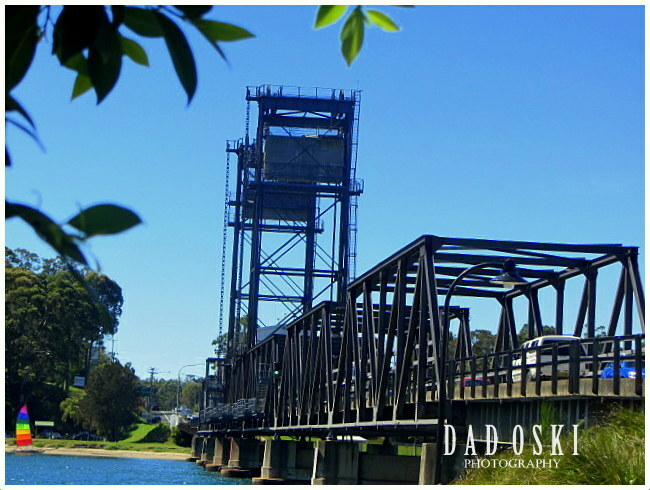 Before noon time we had our lunch at Ulladulla another town, in a place close to the bridge a bridge before reaching the town proper. 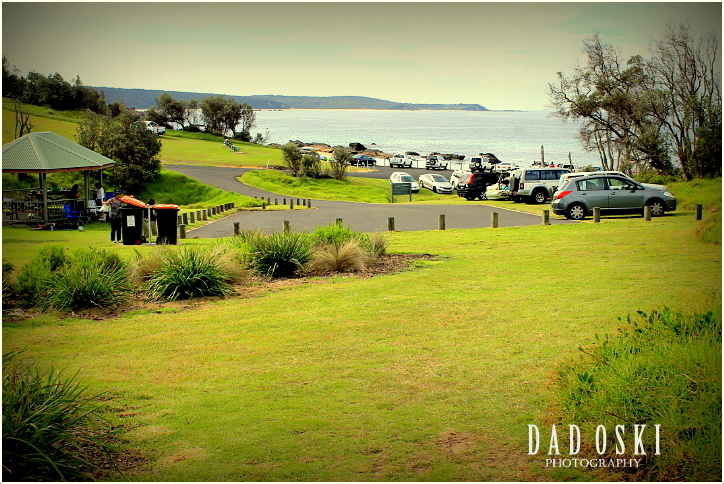 We had our first group photos here and after lunch some guys in our group went to unwind at the town centre while I walked up to the Ulladulla Rotary Park and took some captivating photos of the place and the sea. Right here, I came to know that the place close to where we had our lunch was a fishing ground complete with cleaning or washing facility for fishes that are caught. We had another brief stop at Batemans Bay another fast growing town will surely be a city soon, to wait for the other members of our group left out along the road due to some traffic conditions. 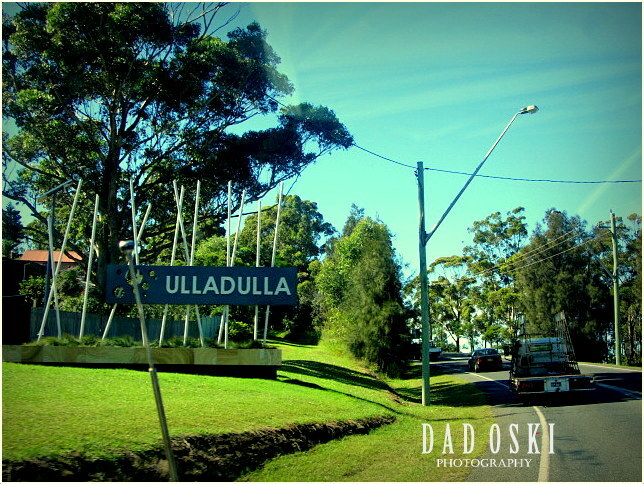 We reached Bodalla, a place famous for its dairy products but now ceased to exist; leaving behind some sort of a museum which became an attraction for travelers. Also, some old equipment like mixing tanks and apparatus, as well as weighing scales are on display, all of them were part of the history that made this place and its people busy, once. After about an hour here, we continued our trip down until we reached Dalmeny. Our camp was at a seafront right up overlooking the Dalmeny beach. It’s an awesome place for camping, a good view of the beach, airy and good facilities. At night, all you can hear is the sound of waves splashing on shore and feel only but the cool sea breeze. Many campers light up their own bonfires while sipping coffee or tea while some playing guitars and others listening to music. A curfew was imposed meaning before eleven at night, the camp should be quiet by then. This was my dream holiday! The thing is, the camp was full of campers when we arrived here, some with caravans and majority of the campers were experienced guys complete with the latest camping equipment. I had some good photos taken at the beach before and during the sunset and photos of sunrise. After breakfast we visited Narooma Lighthouse Museum where the original light and optical apparatus from the Montague Island Lightstation are kept. This Lightstation was the last manned in NSW and is still the only remaining occupied lightstation on the NSW coast. We were impressed and educated on how lighthouse functions and how the apparatus were built, used and operated. After that, we were led to the Mill Bay Boardwalk where we saw schools of fish and brave appearances on shallow water of a couple of stingrays. We also had photos taken walking up and down the boardwalk, which got everybody seemed fascinated in posing at their own style. 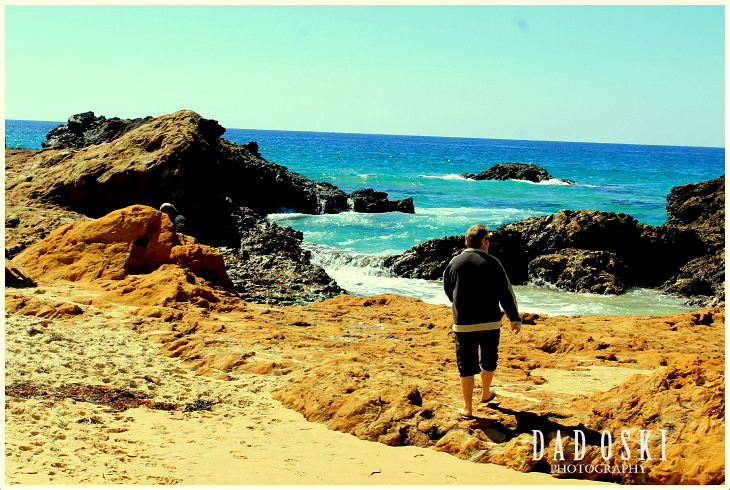 Before noon time, we reached the beach where the popular Glasshouse Rock and Pillow Lava are in Narooma. 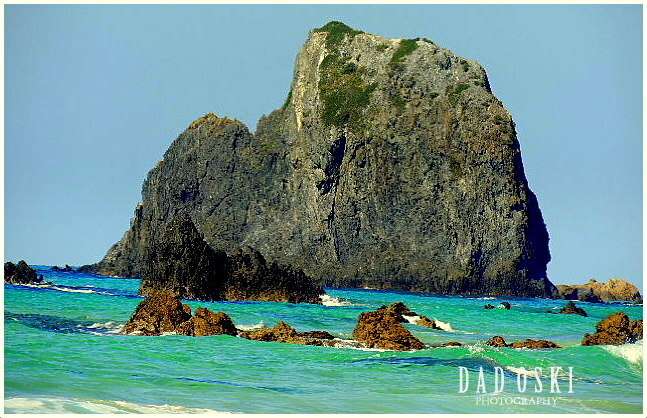 At first we got a hard time looking for the Glasshouse Rock. At that time, it was high tide and to wade closer to the rock was futile as big waves kept on splashing the sandy shore. All I can do was to use my long lens to get some shots of it. I also got some awesome photos at the Pillow Lava area with some of the friends. It’s a place remarkably suited for photography, and had never missed a single good photos of the rocks. We did move up to the Mystery Bay area where some good picnic grounds are, and we took our lunch here. This is another scenic place close to the beach with shades of trees and manicured grass , likewise parking areas and toilets are provided. After lunch, some friends and I drove up to the Tilba Tilba festival which is about fifteen to twenty minutes’ drive from Narooma. Tilba Tilba is a unique place. 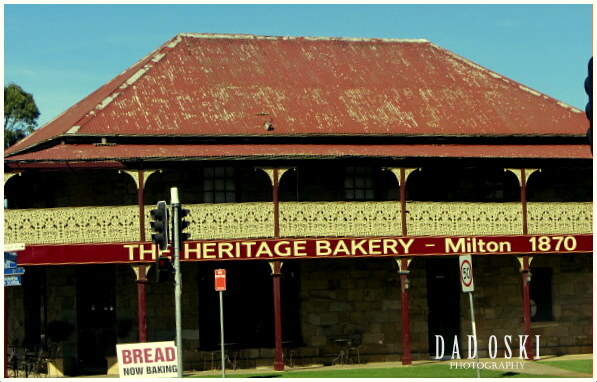 The villages of Central Tilba and Tilba Tilba – and much of their surrounds – are National Trust-classified and as a result has had their unique historical atmosphere preserved. All cars during the festival were only allowed to park at the top of an adjacent mountain and people had to walk down to Tilba for the affair. I admired the place for its stunning environment and that was my first time to see such a beautiful country side, and this I’m sure got their mark for historical preservation. After a couple of hours here, we drove back to Mystery Bay. We had a pretty good relaxation at Mystery Bay to the point that we cooked our food and had our dinner here before driving back to Dalmeny beach. I had several seascape photos taken here, too. 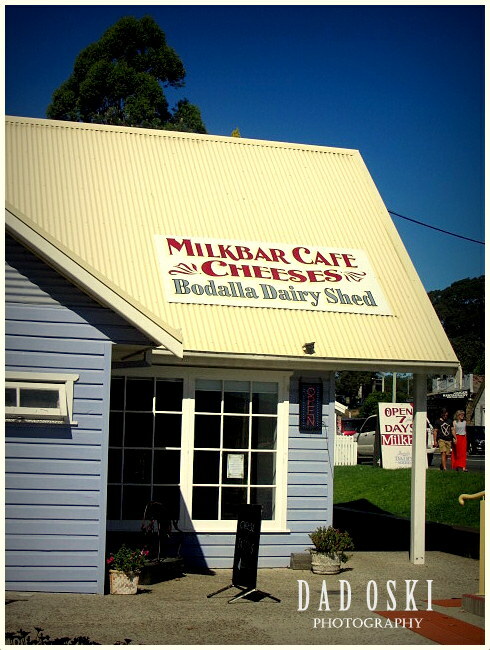 It was already passed ten in the morning when we drove down to Merimbula for the Magic Mountain Park but we stopped at Bega for lunch and for a taste of the popular Australian cheese right at the Bega Cheese Cooperative. 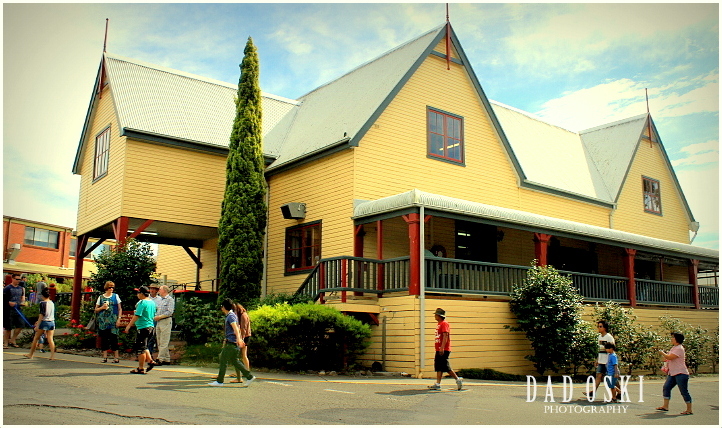 Here, we’ve learnt that the Bega Cheese Heritage Centre was reconstructed and was one of the first buildings on the Co-Op site (1899). 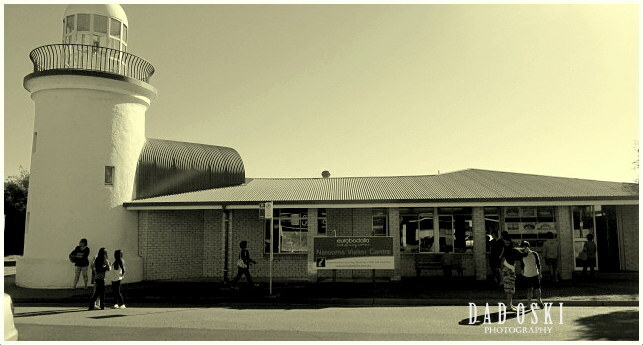 The museum offers visitors the chance to see how dairying has shaped the culture of the Bega Valley. At the Centre some tasting of the different varieties of Bega cheese was allowed as well as purchases from their wide selection of Bega cheese and all other local and Australian cheese. There is also a wide range of gifts and souvenirs. The coffee shop offers a selection of homemade meals and cakes. Most of us had done the tasting and purchased Bega Cheese, too. The next thing we did was to continue the trip to the Magic Mountain, and after twenty five minutes of driving, we reached the place. 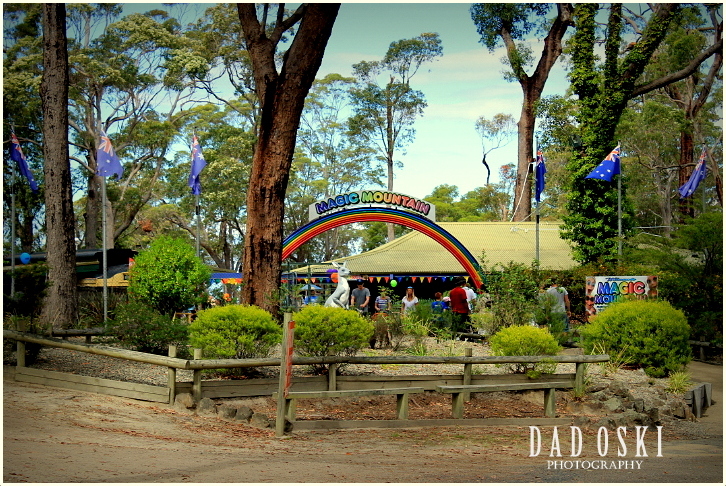 It’s a family fun park with heaps of attractions – activities including grand-prix racing cars, toboggan, water slides, roller coaster, and carpet slide, jumping castle, mini golf and more. 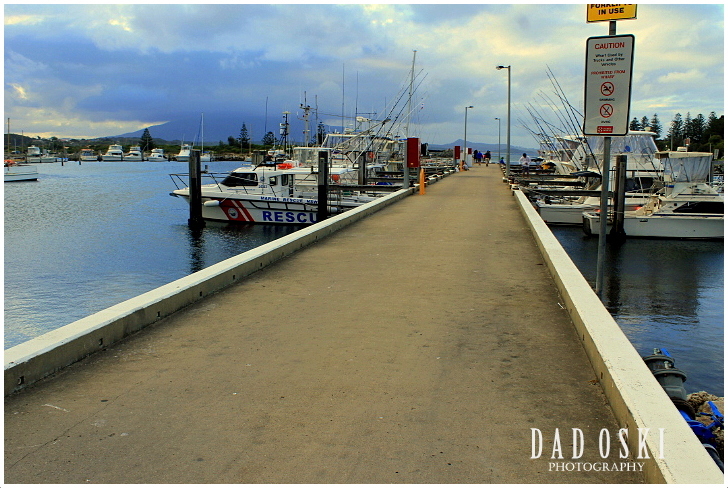 We finished the day with a trip to Bermagui Fishermen’s Wharf. Some friends wanted to go further down south up to Pambula but we haven’t got the time anymore to go there, so we drove back home and stop instead at Bermaqui. The wharf area has been recently redeveloped with a beautiful log built shopping centre that houses and offers a range of shops and eateries. We came here to witness some fishermen unload their catch but unluckily there was none for that day. Oh boy! It was the day to drive back to Sydney. We had our breakfast at the camp site but others wanted to have theirs at Kianga beach which was only a few minutes’ drive away from Dalmeny. Kianga is another wonderful beach complete with picnic and barbeque stands. I got some few shots of the rocks and sandy shore here, and along the walkway up close to the residential houses overlooking the sea. Another beach we drove up for a brief stop on our way back home was the Hyams Beach at Jervis Bay, Shoalhaven. 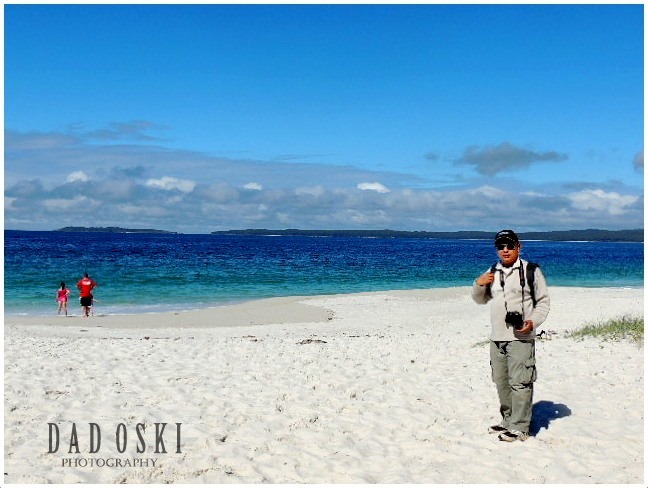 Hyams beach, Chinaman’s beach and Seaman’s beach – the sand at these beaches is known for being fine, soft, and brilliantly white, my first time to have seen such a unique long stretch of white sand. It’s not that boring beach to be as the presence of people here at that time were heaps, some swimming, others were having fun fishing and boating. So, with this exposure to other places of importance to New South Wales, I am looking forward to another long driving holiday, this time up north, bordering Queensland.